In the modern world of interior design, the increasingly twenty four hour world calls for more lighting materials for both odd hours and dark hours. The world doesn’t stop because it’s dark, and modern interior designers are going out of their way to incorporate good, healthy lighting into their rooms. Brightech stands at the forefront of this shift to all night and day interior décor and advances their line of lighting products with a wide range of floor lamps across a wide range of styles and tastes, from the vintage to the futuristic. Below, we will review a few of these lamps. 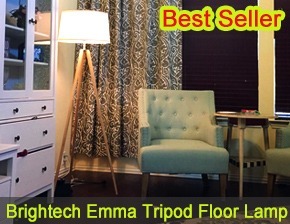 The Brightech Emma Tripod lamp represents one of the most advanced floor laps on the market today. Intended to brighten up any room in a big way the Emma Tripod Lamp incorporates some of the finest home furnishings styles in the modern world. Its legs are an authentic wood material, of which there are three, hence being called a tripod. Its lamp shade is a soothing shade of creamy white and comes in a wrap around cylindrical lamp shade. This is a quiet sort of elegant understatement, a major element of traditional décor the world over, allowing anyone to have find style without being gaudy and crass. The shade is made out of pure cloth and is a more sophisticated contrast to the wooden legs that speak of a more natural beauty. This particular lamp goes especially well with a room filled with a nautical motif. While these are typically studies and guest bedrooms, nearly any room with a nautical motif will get a lot out of this lamp by way of style and elegance. Additionally, the lights are three way lights that operate on standard E26 bulbs of the base light bulb variety. A pale grey electrical cord stretches out from the power sort of the lamp itself and is ten feet long, more than enough space to reach an electrical outlet in nearly any room. This particular floor lamp comes with a 3 year warranty and a promise from the company that if a customer is not satisfied, they need only contact the company to see what can be worked out. The Brightech Madison floor lamp is a major departure from the Emma. Instead of being intended as a standing along floor lamp, the Madison is situated on a stand that doubles as a black wood end table that can hold anything from a trophy to a book to a sandwich. The table is attached to the lamp, which seems to be a typical stylish floor lamp. However, this being the twenty first century, new options are more than available to people and the Madison is one such option. This device comes with a set of built in USB ports intended to allow owners to charge any device they might need to be charged, from a tablet computer to the increasingly impressive and flexible smart phones that just get better every year. Standing at 4.7 feet high, this lamp offers a great deal of style at a price most people can afford. It comes with a choice of two shades. ♦ The first is a solid white cylinder that gets the job done without taking too many risks with the décor. ♦ The second choice of shades is an Art-Deco style shade with a black and white pattern that matches the end table the lamp is attached to. Even better, the second choice of shade takes on the style and personality of the light the lamp is diffusing, making the lamp shade really stand out amongst your other interior design elements. The Eclipse LED floor lamp takes a radical departure from the previous two. Rather than trying to capture a style of the past, the Eclipse seeks to go for a more science fiction look, which some themed rooms really do benefit from. Other people may simply wish to have a strange room with intentionally unusual décor. Whatever one’s reasons for wanting interior décor out of a vintage science fiction comic, the Eclipse has them all covered. A dimmer button on the lamp allows for altering the brightness of the rings. Select among 3 different light levels, taking the double rings from full-on brightness to softer, ambient mood lighting. With a double ring of halos of light intended to brighten up a room with white LED lights, this lamp is always cool to the touch and is slimmed down and capable of being put in all manner of cozy and intimate locations. The lamp has a built in dimmer button that allows the owner to alter the exact brightness of both rings of the lamp and is intended to be a long last and energy saving device using 28-watt LED lights to do the work of illumination for the lamp’s owner. Intended to glow brightly and warmly rather than creating a cold, dull light, the two rings of light have a combined 2000 lumens of light, brighter than some military grade flashlights.